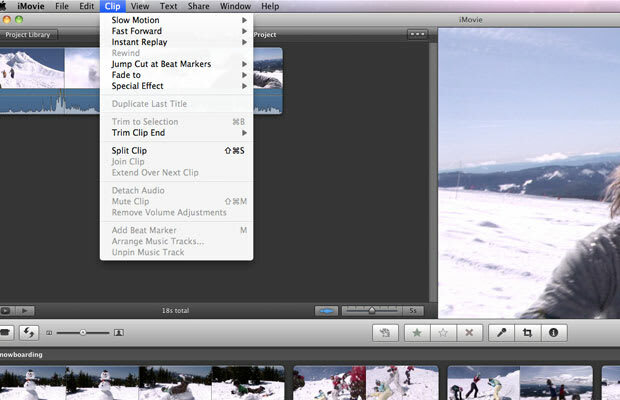 Step up the quality of your video by using one of the many new One-Click Effects present in the “Clips” menu of iMovie ’11. At your disposal is the ability to throw in an instant replay, make everything move in slow motion, speed up everything, fade the action into a sepia tone, a hazy dream-like image, or to Black-and-White. iMovie’s mission is to make it so everyone can make video that doesn’t look like it was made by them. With these new instant visual effects, it moves one-step closer to making that a reality. Choose the clip you would like to add the effect(s) to. Select the part of the clip you would like to add the effects to. Go the "Clip" drop-down menu and choose your desired effect. Your clip will split into three parts. Do not be alarmed. The middle part is the section of the clip that has the effect added.